VidCruiter is officially a part of the Adobe Exchange Marketplace showcasing its integration with Adobe Sign. 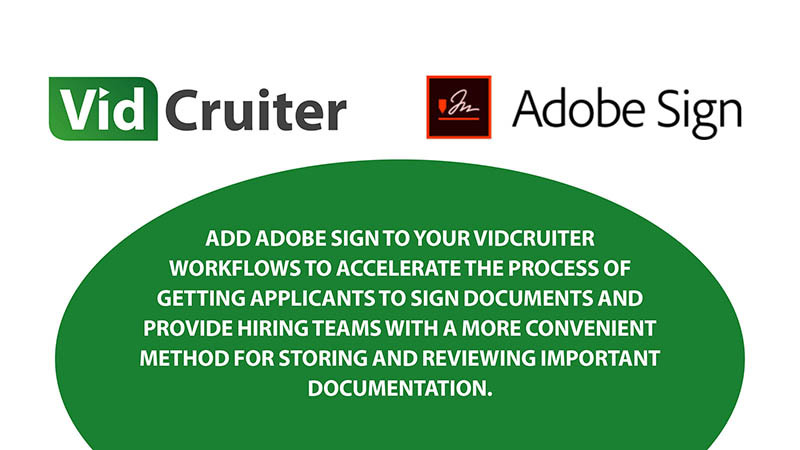 VidCruiter, a technology company which specializes in recruitment software, has now officially partnered with Adobe Sign. By adding Adobe Sign to VidCruiter’s onboarding product, the company has provided clients an easier way to get applicant signatures on important documents. The Adobe Exchange Marketplace is an online forum which allows people to browse different applications, connecting new customers to products with ties to Adobe. The listing provides information about how VidCruiter uses Adobe Sign and even includes a step-by-step guide so potential clients can see exactly how the two software work together. VidCruiter’s main product is live and pre-recorded video interviewing software, however, the company does offer many other recruitment software products. VidCruiter’s recruitment software has helped hundreds of businesses to improve recruitment processes. Discover how we can help you by visiting www.vidcruiter.com.